The pork, chicken, and turkey provided in our CSA program comes from a local farm, Wild Farm, right here in Wellman, Iowa! From pork to poultry, the choice of pastured meats is what makes our program unique and diverse. You will not find options like these in other places! Wild Farm dedicates themselves to raising happy and healthy animals. Their hogs, chickens, and turkeys all enjoy the outdoor air and plenty of room to roam. In fact, their pork is GAP certified. Read on to learn more about the individual practices behind raising each animal on their family farm! Shawn and Cara Slaubaugh along with their four children raise animals on their small family farm in Wellman, IA. They believe in pasture-raised meats and that the quality of your food matters. We are proud to partner with them in our Community Supported Agriculture program! You can also find their meats in our Country Store. This program improves the lives of farm animals in a step-by-step process and provides audits of farms and ranches every 15 months. For pork, this means that they live free from cages, crates, or crowding. They have an enriched environment and access to the outdoors. Wild Farm’s hogs have access to the outdoors at all times and provided with fresh hay to sleep in. You can learn more about GAP pork standards here. Wild Farm’s pork is hormone and antibiotic free. They are raised on non-GMO grain grown and milled by Farmer Shawn. They are a Berkshire cross breed with origins from Great Britain. The meat is darker than standard pork and richer in flavor. Cuts of pork available in our CSA program vary on a bi-weekly basis. These cuts can include chops, smoked and fresh ham roasts, cured and uncured bacon, loin roasts, spare ribs, hocks, shoulder roasts, and more. Wild Farm’s chickens are raised out on pasture with plenty of room to roam and a coop to protect them at night. Their days are spent foraging in the tall grass for insects, worms, and other yummy treats to eat. The chickens are fed a non-GMO grain blend grown and milled by Farmer Shawn. They are antibiotic and hormone free. All chickens are a Cornish cross breed, known for their superior breast size and taste. The difference is that Wild Farm’s chickens get a LOT of exercise, which improves their quality of life and allows them to have a far better flavor. Their pasture is continually rotated, including the placement of their feed, which ensures that they must move around to get that much needed exercise. Our CSA program receives both whole and cut chickens bi-weekly. 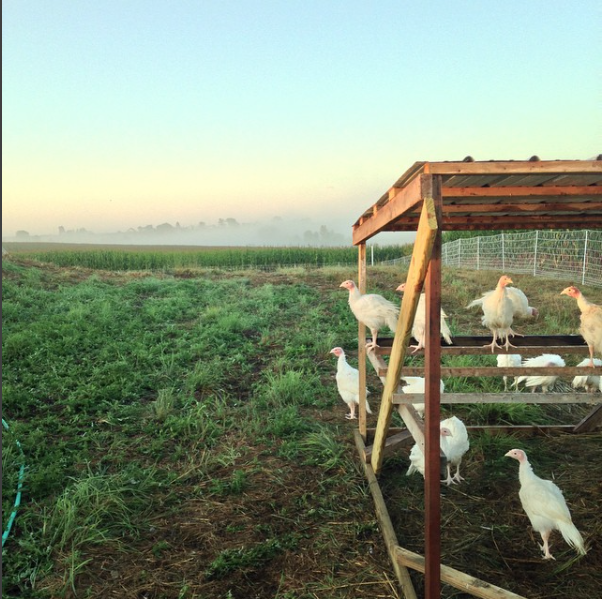 Wild Farm’s turkeys are raised out on pasture with plenty of room to roam and a coop to protect them at night. Their days are spent foraging in the tall grass for insects, worms, and other yummy treats to eat. The turkeys are fed a non-GMO grain blend grown and milled by Farmer Shawn. They are antibiotic and hormone free. All turkeys are a Broad Breasted White, which makes a great addition to the table. Females reach mature weight at 20-25 pounds and males at 45 pounds. The difference is that Wild Farm’s turkeys get a LOT of exercise, which improves their quality of life and allows them to have a far better flavor. Their pasture is continually rotated, including the placement of their feed, which ensures that they must move around to get that much needed exercise. Our CSA program receives a whole turkey in mid to late November every year.